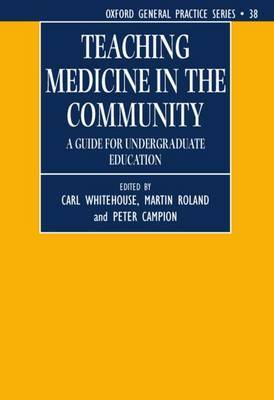 This book is for all those who teach general practice to medical students, both those based in academic departments and `service' general practitioners. It aims to combine the theoretical basis for teaching with practical material, and explores the extent to which general practice can and should take on teaching traditionally carried out in hospital (e.g. basic clinical skills training). This is a well written, easy to read book ... This book will be helpful to those who have already been involved in teaching in the community and to the many future teachers who will be needed now that so much more treatment and investigation is done outside hospital. The 35 short chapters offer succinct outlines of modern medical education that will be of value to anyone who wants to be a better teacher.